If you’re looking for a high priced Schmidt-Cassegrain telescope with a lot of updated features, then you’ll love the Nexstar 6 SE. From top to bottom this is a top tier product that doesn’t shy away from giving users the best options, all in one easy to use package. It comes in a variety of styles, and even at the lower end of the models still maintains a very respectable amount of power when stargazing. The mount included is also rated as one of the best in the industry, and will more than suffice if you need to use it on different surfaces. There are four available styles to choose from, and there are 4 inch, 5 inch, 6 inch and 8 inches. In a Schmidt-Cassegrain style users should expect the same quality as always, with the color being attractive enough for all sizes but not too distracting like a metallic blue. Buttons are located away from vital areas so you won’t mistakenly press them. The included remote is almost as big as the scope, so will work great for people that have a hard time seeing small print. But if you’re looking for something fancy that will sparkle when the sun hits it then the NexStar 6 SE isn’t the one. With all of the specifics in both the design and controls, then this advanced telescope is suitable for intermediate users and up. Ambitious beginners can hop on board, but the multiple feature set in the remote control alone will make things difficult for a user that isn’t familiar with astronomy already. There are also power settings that won’t be optimized for buyers that have never handled a telescope before. Besides being disorientating the first time they use it, it may shatter their confidence a little. When dealing with telescopes that have electronic parts, durability will always come into play. That is also the case with the NexStar 6 SE, which has some seriously advanced electronics within the interior. The remove that is attached to it is big and bulky, and far from being a flimsy little card remote. So there are no worries there, and the mount and the tripod are solid. The only thing left is the telescope itself, and as an extension of the mount it works really well even after unpacking from a long trip. Small adjustments may need to be made, but it is otherwise solid. There are way too many to list! Which once again is the reason this is better handled by buyers that know how to use telescopes. Having multiple styles gives options to those that want to avoid a certain size. Some users buy this as a second telescope to complement their main one, so having two of the same size would be pointless. StarBright XLT high transmission coatings are the standard features of all 4 stylings. The included accessory tray is large and will fit everything you put on it. Using the quick release fork mount you’ll have less trouble packing up or reassembling the telescope. And with it being a no tool setup customers won’t have to worry about doing any extra adjustments since it can be done by hand. Using the SkyAlign system takes a lot of the guesswork out of the many objects you want to look at in the sky. This automated system is even more valuable in situations where time is of the essence, and allows you to align to an object quicker than in any other system. Beginners will want to make this purchase due to how good a deal it is, and the manual doesn’t give them a good starting point. Because of the bigger learning curve beginners will also miss out on some of the key features of the product that make it great in the first place. There aren’t any models above 8 inch, although none of the sizing’s lack for power. The price is also a bit high considering that there are other models in the NexStar series that may be more appealing based on features. And the remote may be a little big for smaller hands to handle. Bundled with both features and accessories, the NexStar 6 SE comes with an incredibly complex but easy to use computerized altazimuth mount that blows away the competition. Packed with the steel tripod and accessory tray, it is a winning combination that will stay with you for years. A small but handy StarPointer finderscope will work wonders in the difficult night sky when you are looking for something specific. The large hand controller is flash upgradeable so you will always have the latest built in software. And it features a double line, 16 character liquid crystal display with backlit LED buttons. Even at this high a price you are getting an incredible value. Taking into considering the computerized mount alone, that is worth a couple of bucks by itself. Add in the fact that they threw in future updates and made the entire setup futureproof, and you have a telescope purchase that could last you a couple of years without issues. The object database includes both professional and user submissions, so expect it to continue to grow rather than stay stale and static. With the internet and GPS features built to work right out of the box, this is the most hassle free top tier product you can get your hands on. So with other products already in the NexStar series that may catch your interest, is it worth putting money into this one? Definitely! Each NexStar product has its own pros and cons, so if you end up deciding to purchase this one you aren’t buying old tech. It will continue to be a top tier telescope even years after new ones come out thanks to its easy upgradeability. A good example of this is watching how other scopes have gone down in price since their release, yet this one remains hot and at a steady price point. 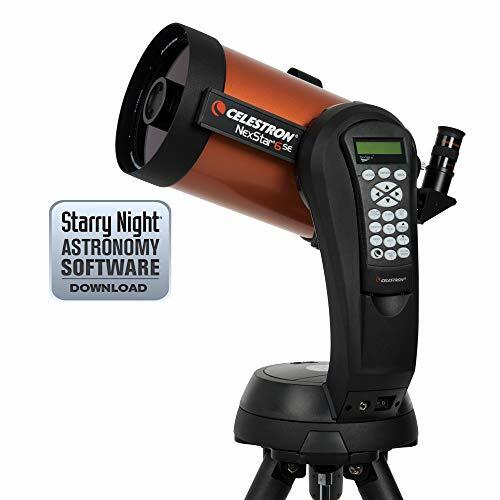 Although it would be easy to compare it to another NexStar model, the better way to judge it would be to look at the Celestron AstroMaster 114EQ Telescope w/ Motor Drive. From the same company, the AstroMaster is just a notch below on technology but really gets a boost when it comes to power, even when compared to the NexStar’s 8 inch model. What you’ll miss out on though is that this is not as automatic and user friendly as the NexStar, right down to the lack of a large remote. The Astromaster is a powerful telescope that will fit the bill for the upper level users but loses some of its charm for the entire package. If you’re not worried about saving a little money, then you should stick with the NexStar 6 SE as your prime choice. Automated features with great upgradability makes this one of the best choices you’ll ever make when it comes to a purchase that concerns stargazing. If you want to do more looking at the sky than micromanaging settings then this is the best option, and will do wonders in group sessions.